A very refreshing no-frills just makeup kind of a post today. If you are among my bazillion YT channel subscribers (bwahahah! ), you would have seen I had picked up one of the big palettes from Pat McGrath Labs, Mothership II Sublime Palette which has some eye-popping shades (here). I really don't really like giant palettes so makes no sense why I would pick that up. Recently three smaller 6-pan palettes were released, including this Platinum Bronze one. I don't even like cardboard packaging. I promptly threw away the outer cardboard packaging on my giant Sublime one. The artwork is stunning though. It is quite sturdy with magnetized flaps and a big quality mirror. Among the three 6-pan offering, this looked like the most neutral and wearable. It has a nice array of cool and warmer toned neutrals and a gorgeous rich bronze. Scroll picture to see names of each shade. 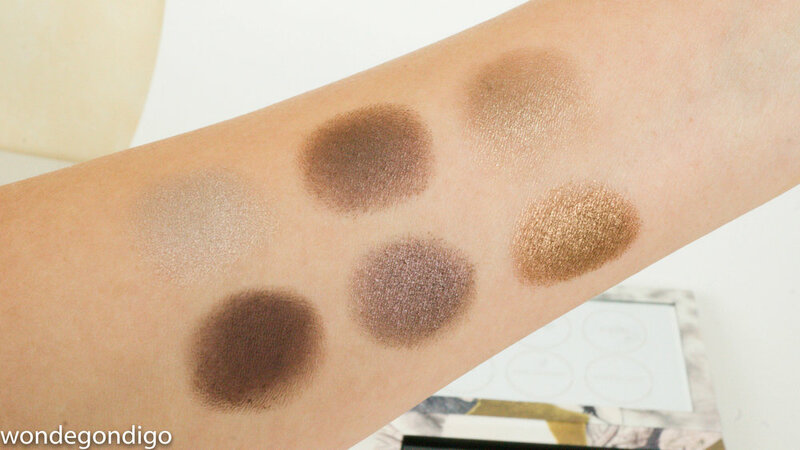 While the pans look like a varied set of light to dark shades, on the skin each shade applies very dark. Each shade is rich in pigmentation and has a smooth suede texture. However both Sextrovert (that gilded bronze) and Ritualistic (deep lavender taupe) both were grittier and with slight fall out. These shades all adhere very well on the lids and for me, over Nars primer lasts well. What I realized when playing with this palette is that it is important not to over-blend. With the depth of the shades that are similar, and with its rich soft texture, it's really easy to end up with a muddy blur. Sextrovert is the star for in. In the look below, I'm wearing Sextrovert in the center of the upper and lower lids. I have Smoke & Mirrors on the outer thirds and Ritualistic in the inner thirds. I applied Telepathic Taupe lightly into the crease and lightly blended between shades and around the edges. The effect is very smoky, not nearly as easy-going and everyday as I had imagined. Wearing some other new things in this look: Addiction blush in Suspicious, SUQQU's new lipgloss formula (Flawless Lip Gloss) in the LE shade 101 Tsuyabudou, which is a purple tinted sheer shimmery gloss. At this point, I am super satiated with PMG makeup. What about you, any new brands you've been dipping your toes into or have you tried these new Pat McGrath eye shadow palettes?